STX is a Korean manufacturer founded in 2007 but, in 2014, the company changed its name to “E&R Solar” after the acquisition operated by GS group. All manufacturing plants are located in Korea and can reach an overall yearly capacity of almost 200MW of mono and polycrystalline panels with a power ranging from 225 and 310 Wp, making them the ideal choice for any medium sized residential use or for small commercial applications. The company is completely vertically integrated, meaning that it can undertake any stage of the process from procurement to research and development, from the design to the final installation. All their products are CE, JET, UL, TUV, and IEC certified. The company is mainly focused on serving the Asian market since the only international office they rely on is located in Japan; this means that, should Australian customers have any particular need or enquiry regarding E&R Solar’s products, they should get in touch either with the Japan division or directly with the Korean headquarter in Seoul. 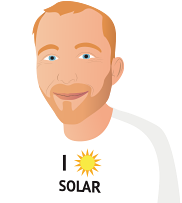 If you want to know more about E&R Solar series of PV solutions, make sure you read the reviews here below from customers who bought their solar panels in the past, or take a look at the solar products listed on this page to find the ones that best fit your needs and requirements. My rating may be unfair since last year in SA was not sunny and we had a lot of clouds and rains.